Wade got a new raincoat this week. Well it was a hand-me-down from a friend, but it looks brand new. The new/old raincoat pretty much made Wade's day, week, month....year? He was incredibly happy. 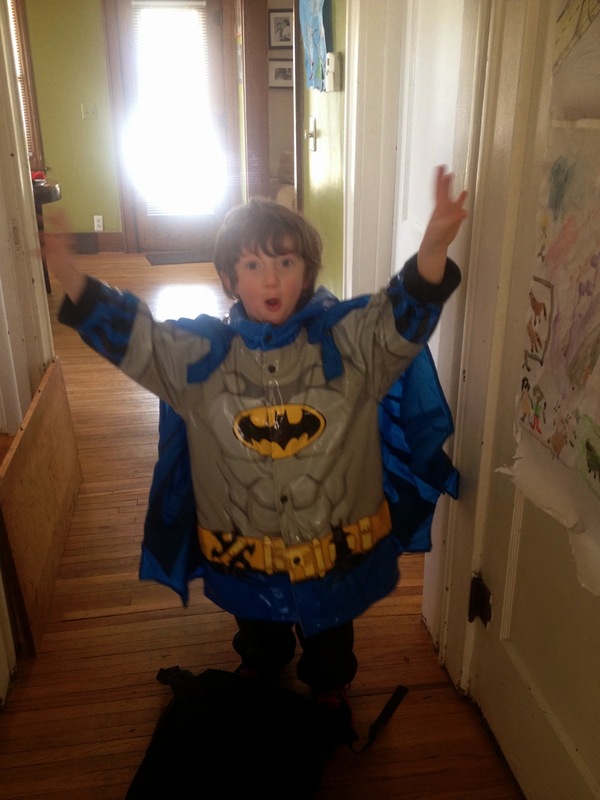 Because you see, this new/old raincoat was a superhero raincoat and it had a cape. But guess what? 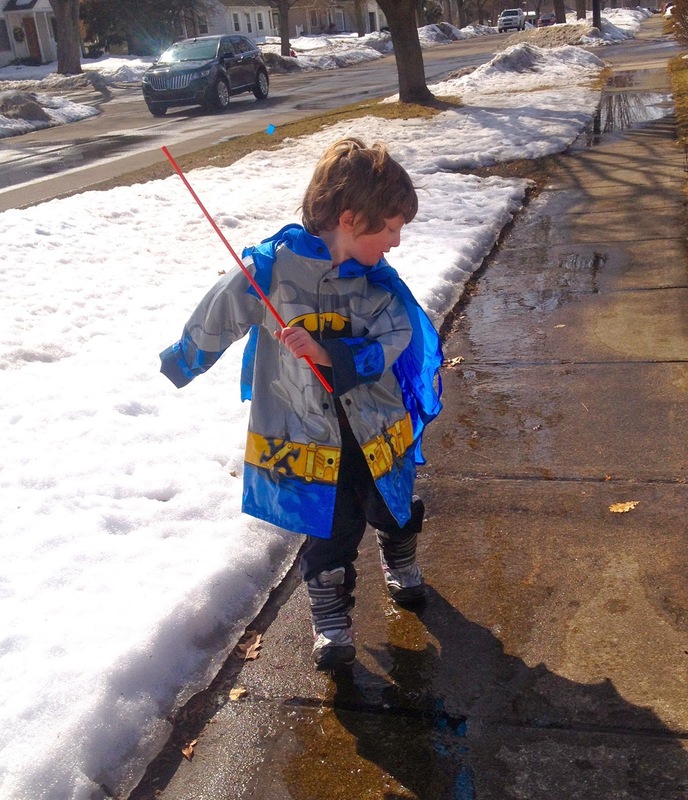 The raincoat didn't only make Wade happy, it made everyone that walked by him happy. Grumpy old men at the grocery store smiled when they saw him. Women at the gym told him how cute he looked as they lovingly watched him zoom by them. Person after person everywhere we went this week looked happier when they saw Wade in his superhero coat. Even the too-good-for-us tweens getting off the bus after school one day. This coat really did have superhero powers. 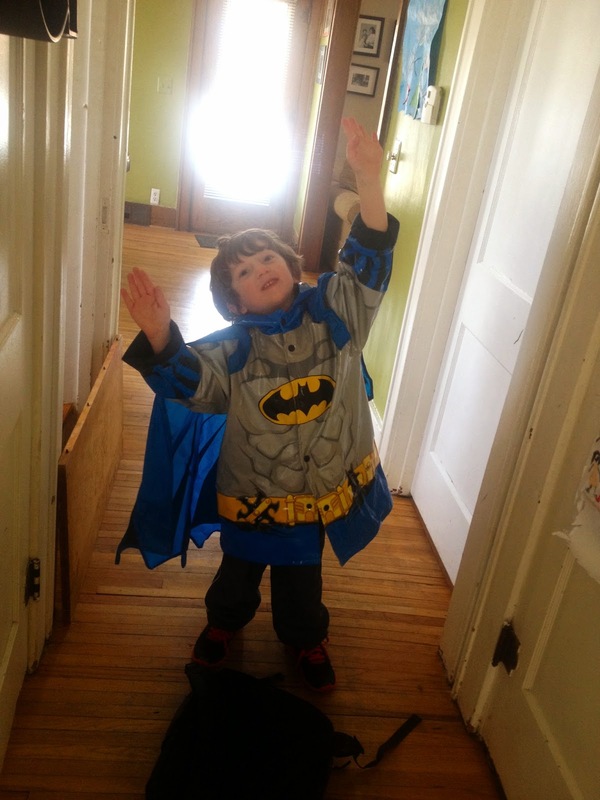 It's like the coat reminded everyone how much fun make-believe can be and believing in super powers and flying and capes and fighting the bad guys and righting the world. Maybe it also reminded everyone how it's really pretty simple to be four years old and how sweet it is to be in love with a new/old raincoat. I know for sure this week, that's what it did for me. Wade's only problem this week was running to make his cape go higher and trying to look behind him to see it at the same time. Yup. Spring is here? Okay, I know for sure the calendar says so, but the weather is still pretty meh. But daffodils on my table and sunlight through my window did make it a little spring-y. Sunshine and daffodils make everything better--even my crappy broken blinds. I hate blinds. I have been watching too much Scandal. Even though I haven't watched last night's episode yet, I know I'm watching too much because I totally believed that B316 had something to do with the disappearance of the Malaysian plane. I miss Tina Fey and 30 Rock on Thursday nights. Every now and then when I'm feeling down or grumpy, I re-read parts of BossyPants or watch YouTube clips of Tina like the one below. I always laugh. Wade is definitely the baby of a big family. 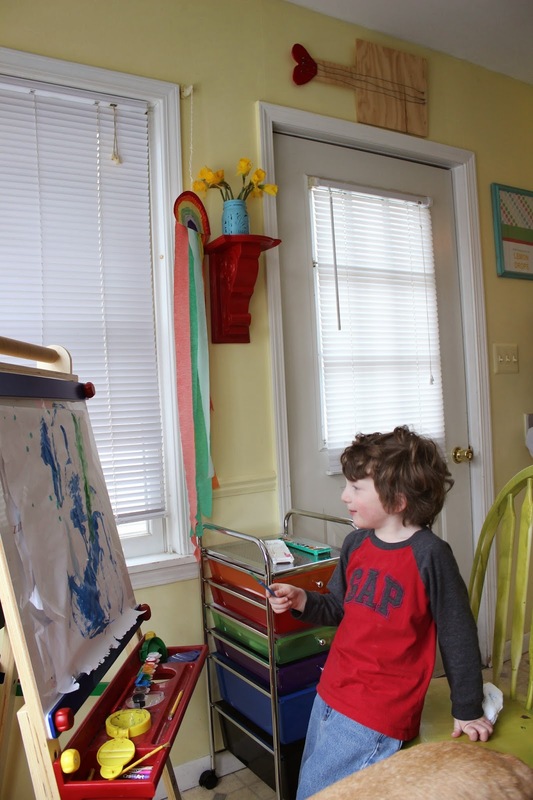 After a sweet afternoon of painting, I asked him what he had painted and he proudly said "a battle scene from The Lord of the Rings." Yes, he's seen that movie. When I hear the song Happy on the radio it makes me grumpy. I know, I'm ridiculous, it's just on too much. But, seeing Meryl Streep shimmy while Pharrell sang it at the Oscars? Yeah that made me happy. And watching this children's choir from Detroit sing it made me smile too. Some families go to Disney World for a good time, we take our kids to Home Depot. The great thing is my kids seem to have a blast, so it's all good. I am very excited about Mad Men starting on April 13th. The countdown is on. I love getting to know everyone through pictures. 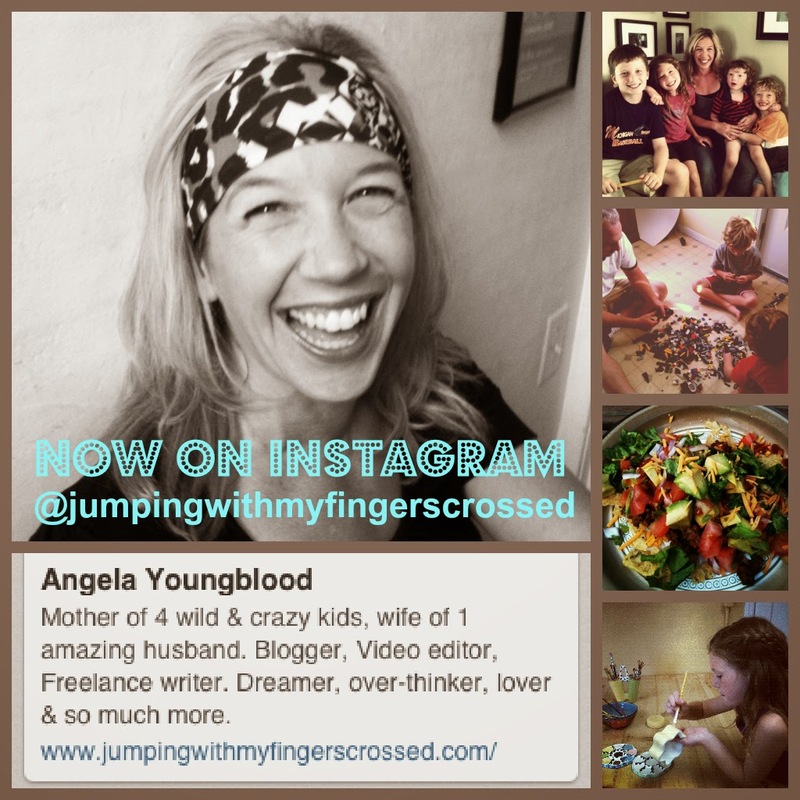 Please come play with me on Instagram @jumpingwithmyfingerscrossed. I love his raincoat! I can see why everyone smiled when they saw him - how could you not? I mean, how can you even be grumpy walking around with a little Batman?! 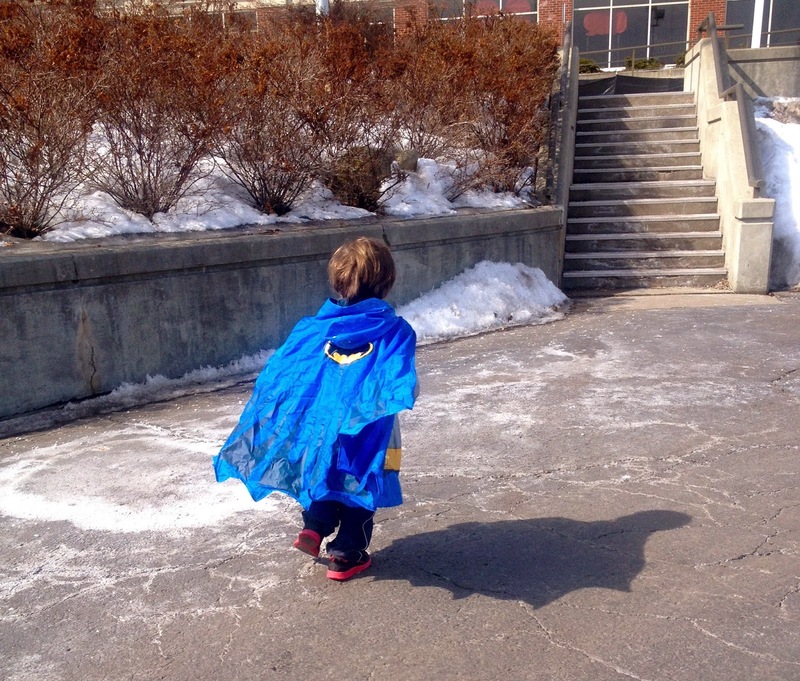 I adore that he was trying to watch the cape while he ran. I am also verrrry excited about Mad Men on April 13. Maybe a little too much, just maybe?